If you’re looking for a new filter for your aquarium yet can’t find a model with a price you can afford, then you’re in luck. Our job is to scan the internet for the best filters on the market, compare their specs and pick the ones which offer the best price for the quality. So if it’s the best budget canister filter that you’re after, then Dr. Fox can point you in the right direction by suggesting that you buy the Hydor 150 Professional filter. It offers good performance and plenty of features just for the right price. In the unfortunate event that it’s not available, then the Fluval 206 is also a pretty good pick. Ideal for aquariums ranging between 20 and 40 gallons in volume and featuring a 190 gph pump output, this filter is worth taking into account if you’re looking for a durable product that delivers the promised results. It will keep the water in your aquarium clean without taking too much space thanks to its compact design. What’s more, the product is easy to clean. Several users experienced leakage issues while others say the product is not very durable. Make sure the fish in your aquarium enjoy a clean and healthy environment by using this water filter. If you’re on the lookout for a filter for a medium-sized tank, this model should not go unchecked. 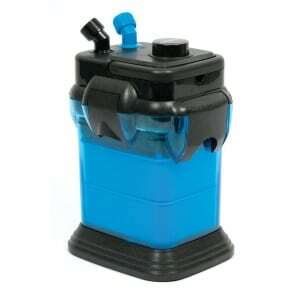 It has a flow rate of 206 gallons and can be used for aquariums of up to 40 gallons in volume. The filter was designed to ensure easy maintenance. Due to the high-grade bearings, you will enjoy a smooth and quiet performance as well as minimized vibration. Durability might be an issue according to a few buyers. Some of the filter parts broke easily. 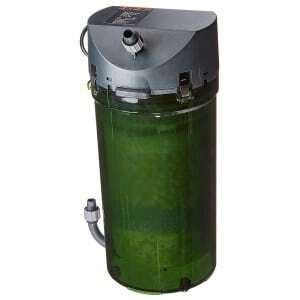 Keep the water in your aquarium clean and crystal clear if you go for this canister filter. Designed to handle aquariums of up to 66 gallons and ensuring a flow rate of 116 gallons per hour, this product should not go unchecked before you make your decision. It features first-class components, which means that the item will keep up with extended use. The water is filtered biologically, mechanically, and chemically. The item is also easy to install. The plastic used for the canister is brittle and can break easily according to a buyer who tried it. Consider this product if you want to provide your aquarium fish with a clean and healthy environment. 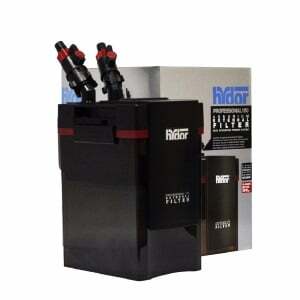 While being the smallest product in the series, the Hydor 150 is a professional-grade filter that packs quite a punch. It is best suited to aquariums ranging between 20 and 40 gallons in volume, having an impressive 190 gph pump output which can recirculate nearly 5 times the entire volume of a 40-gallon tank in just one hour. This doesn’t just mean high performance, but also less maintenance for your tank. Thanks to an intelligent design and small size, this filter is meant to fit in anywhere beneath the tank, working out of sight to provide your aquarium with the clean filtered water it needs. The easy priming system pressurizes the filter, forcing water directly through all layers of media and ensuring the largest contact surface. 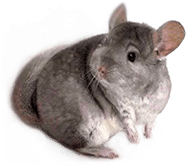 Since no water bypasses the filter media, as is the case with many other types of filters, you can easily see when you need to clean it – just look at the filters, if they’re dirty, that means it’s maintenance time. 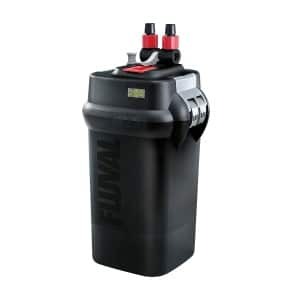 If you’re looking for good filter for a medium-sized tank, then you can’t go wrong with the new Fluval 206 External Filter. Just as the name implies, its pump has a flow rate of 206 gallons that can easily handle any aquariums of up to 40 gallons in volume. 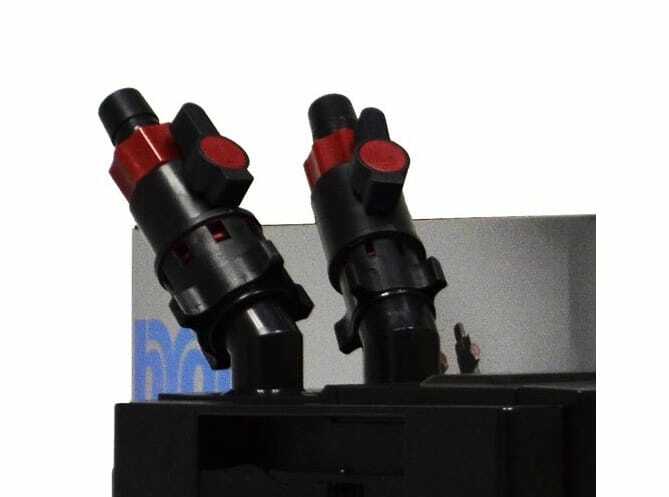 Thanks to the AquaStop valve system you can easily cut the flow of water in the filter without the need to disconnect all tubes and hoses, which is also helpful in avoiding leaky messes. Combined with the Lift Lock clamps and quick-to-change filter media, replacing and cleaning filters is a job you can perform in minutes without getting your hands too dirty. The high-grade bearings ensure smooth performance of the impellers while also minimizing vibration and noise, making this a powerful yet silent filter which won’t disturb either you or your fish even when working at full capacity. The multi-stage large filter media provides superior filtering and crystal-clear water for all your aquatic species to enjoy. The EHEIM 66 Classic is one of the decently-priced medium filters you can find on the market. It can handle aquariums of up to 66 gallons, and its high-performance pump can deliver a flow rate of 116 gallons per hour. Made with first-class components, this filter is made to work for long periods of time between scheduled maintenance. This is not only a good canister filter on a budget, but it’s also economical in the long run, thanks to an efficient motor that uses only 8 watts of power. The filter comes with a complete filter media package including Substrat Pro and Eheim mech. These filter media stack up on each other to provide superior filtering and ensure that the water is filtered biologically, mechanically and chemically. Setting up this model is relatively easy even if you aren’t the handy person type, and you get everything needed for installation, including hoses and inlet pipes, a spray bar and accessories. The Penn Plax Cascade 700 is a heavy-duty filter that’s ideal for tanks of up to 65 gallons. The self-priming pump gets activated at a simple push of a button and can deliver a high flow rate of up to 185 gallons per hour. Thanks to the two independent valve caps, positioning this filter should be worry-free. With this model, you also get control valves to adjust flow rate and optimize the filtration cycle or save power when not needed at maximum power. The base is made of solid rubber which will ensure that the filter is stable even at higher flow rates. Each Penn Plax Cascade 700 comes with tubing for input and output, large filter trays as well as all the filter media you need to get started. The filter trays can accommodate multiple layers of filters which not only improve efficiency but also extend replacement periods and maintain ammonia-neutralizing bacteria alive. 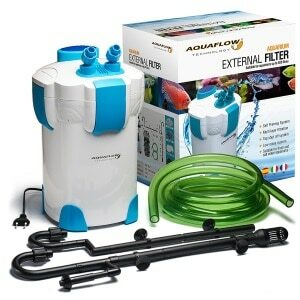 The Aquaflow Technology AEF-302 has received quite good canister filter reviews, making it one of the top choices for fish tanks of up to 75 gallons. The self-priming powerful pump provides a maximum flow rate of 264 gallons per hour, yet only uses 18 watts, ensuring high-performance filtering while being very light when it comes to utility bills. Measuring only 9″ L x 9″ w x 15.5″ H, this compact model won’t give you a hard time when it comes to positioning, as anywhere near the fish tank should do. The blue and white colors will also match the water as well as any complementary-colored decor near the tank. The AEF-302 comes with a filter media start-up kit and a flexible system that allows you to decide where to put the activated carbons, bio-balls, and ceramic rings to create a filtration system which is optimized for the specific environment of the aquarium. When it comes to canister filters options abound. There are many models out there that can satisfy even the most pretentious of customers, yet can cost an arm and a leg. There are also cheap models that boast superior performance only to fail in the first few weeks of functioning. So how do you find a filter with a good build and decent performance that won’t break the bank? We’re here to answer these questions and provide you with the knowledge to make an informed decision. We know that you work hard for your money and wasting it on a model that isn’t worth its price is the last thing you want. This is the reason why we’ve written this short guide, to explain the relationship between price and quality and which features are worth paying extra for, as well as to present you with a list of top products that we think are the best for a limited budget. While there are quite a few bargains out there, you should remember that old saying that ‘you get what you pay for’. If you have to tend to a 100-gallon tank, don’t expect to find a cheap filter. If you do find one which claims to do this and that and makes promises short of landing on the moon, then you’re probably being conned. If it’s too good to be true, then it probably is. Depending on the size of the aquarium, its maintenance requirements (which often get dictated by the number of fish, which plants you have), its flow rate and extra features, you can expect to pay a good amount of money on a filter. While higher quality usually implies a higher price, that doesn’t mean that you can’t find a model on a budget. We’ve found plenty of models that are more than worth their price when considering performance, build quality and the overwhelmingly positive reviews they received from customers. So if you stick to your budget and consider which specs are most important in a filter (and follow our guidelines), you’re bound to find one for sale that’s perfect for your aquarium and at an affordable price. If you manage to get the best canister filter for the money and can still afford extra filters, you should definitely buy a few. Many models allow for full customization of the filter media trays and filters, so you can arrange them depending on the specific needs of your fish, corals or other species. With more filters of higher quality, you can create a healthier environment for the fish, minimize maintenance as well as cut the costs of treating diseases due to water pollutants.